This watch is the large gents size. Model Number WSTA0028. Model Tank Solo. Overall Score 10/10 - Unworn. Dial 10/10 - Perfect. Watch Band 10/10 - Unworn. Serviced Unworn From Factory. Case 10/10 - Unworn. Genuine Daniel Wellington Classic Petite Sterling DW00100164 is an incredible interesting Ladies watch. Case is made out of Stainless Steel while the dial colour is White. This watch is market as water resistant. 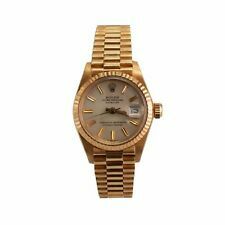 Raymond Weil - 100% GENUINE "Geneve Tango" Gold plated Lady's Bracelet Watch - Model No. 5360 With Saphire Crystals. Watch Model No. 5360 - Serial No. Z149830 - Auto date - New battery - The watch face is 29mm across - Stones are all in place around the face and inside the face which has no scratches on it. Supplier Code AR1733. Strap/Finish Leather,Stainless Steel. Dial Colour Black. Case Size (mm) 41. If the item is for collection only we are happy to accept cash on collection. MODEL IS EMPORIO ARMANI AR1949. EMPORIO ARMANI WATCH. SILVER BATTON MARKERS AND SILVER LUMINOUS HANDS. EMPORIO ARMANI LOGO AT 12 O'CLOCK. 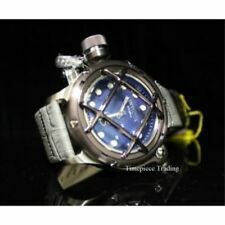 20mm WIDE BLUE STRIPED LEATHER AND FABRIC STRAP FASTENS WITH A STAINLESS STEEL BUCKLE ETCHED WITH EMPORIO ARMANI LOGO. Strap Material Leather. Strap colour Brown. Strap - Good, Original. Dial Colour Brown. Case Material Stainless steel. Case - Hairline scratches. Case depth approx. Case width approx. It’ll make a beautiful gift for that special guy in your life. Genuine Mercedes Benz Mens Elegant Basic Watch B66953067 New. Dispatched from UK using Royal Mail 1st Class. It has had a gorgeous black dial with three subsidiary dials representing Chronograph, main Seconds and 24 hours. 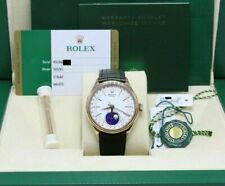 There is also a calendar at 4 o'clock, Water resistance to 100M. still has its rear clear factory protective sticker. Off White calfskin leather crocodile-effect embossed strap. Swarovski crystal hour markers. Buckle clasp. Mineral crystal. White dial with silver-tone hands. Manufacturer: Hugo Boss. - dial colour: black. - dial style: sun grinding. - logo on: dial, crown, back, buckle. - case material: stainless steel (brushed/polished). - bezel made of: stainless steel (polished). This striking analogue watch flaunts a bronze tone bezel and a brown, leather strap. Would make an ideal gift. Stainless steel. New, boxed and sealed. Antoneli Unisex Watch Analogue Classic Quartz Watch Brown Leather Strap Genuine. 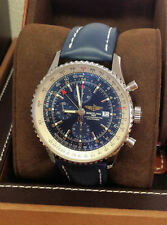 As seen in the picture, its got brown leather strap. with cute deep blue face. 2 YEARS WARRANTY. Dial: Brown Dial. Band: Brown Leather Band Like New. Features: Automatic, Date. Functions: Automatic. A hardened mineral crystal with an anti-reflective coating provides the necessary protection, while silver-coloured hands with Super-LumiNova® detail and a black calfskin strap round off the attractive look to perfection. The classic look and exquisite construction is perfect for the discerning watch owner. Mineral scratch resistant glass. 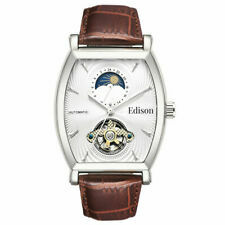 Watch features Styled for the elegant modern man this watch would be perfect. The One watches have taken the classic watch design to a new level. Dial Window Material TypeMineral. Not a single scratch or stain. Don't use in shower, bath etc. Band Colourmulticolour. Band Materialleather. · Inner and Outer Official Panerai Boxes. Case Size: 44 mm. Case Material: Stainless Steel. Water Resistance: 300 m. Fastening: Pin Buckle. Bracelet Material: Leather. The black dial, for example, features attractive red and silver-coloured details. Can't Find What Your Looking For?. Model Number: PM3083X1. The chronograph has a timing capacity of 60 minutes, and has an accuracy of 1/10th of a second. A textured ‘anthracite’ dial with date display and rose gold hour markers gives this watch an elegant and contemporary feel. Case Thickness : Approx 1.4 cm (1/2"). Band length(open) : Approx 25.0 cm (9 7/8").